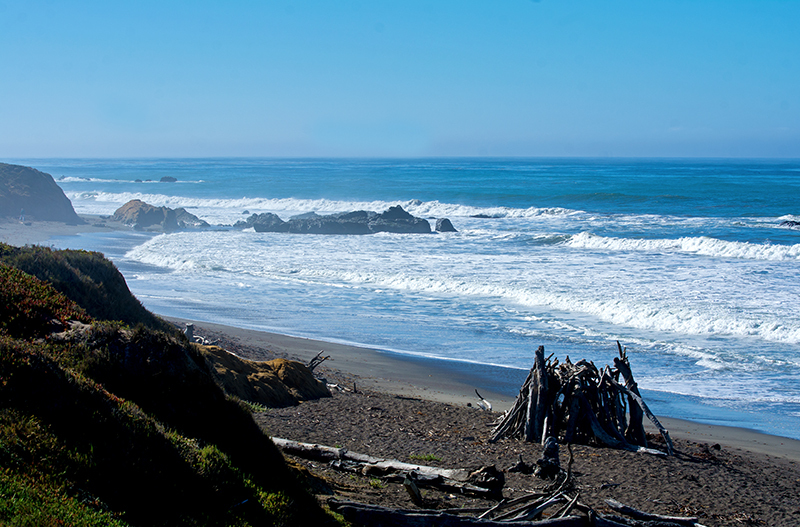 Moonstone Beach, is just north of Cambria on the Central California coast. 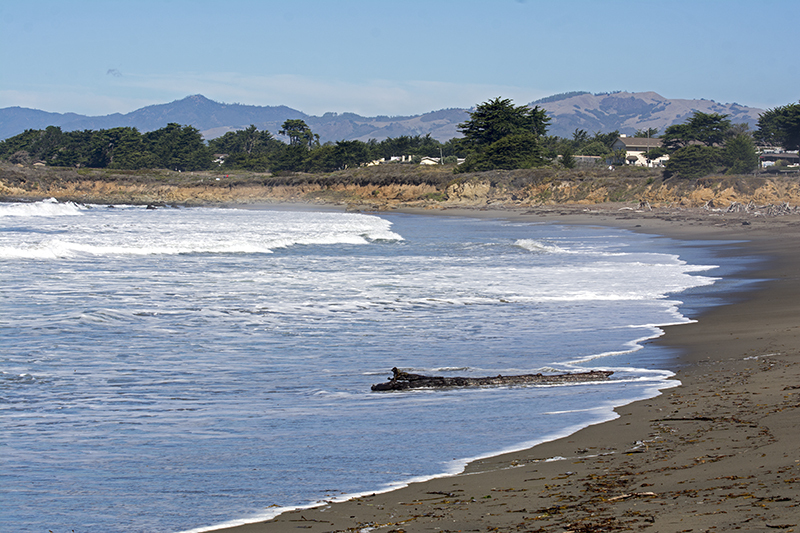 Running parallel to Highway 1, Moonstone Beach Drive runs right along the picturesque bluffs of Moonstone Beach. Since this is a popular area, hotels line the street with most of them featuring a sitting area out front for guests to enjoy the spectacular view. I know from experience that the hotels are way more costly in the summer months as I tried to get a reservation during this time without much success. They were booked pretty solidly through the warm months. Across from the hotels you will find various entrances that lead down to the beach. I say down, because you start on a bluff and descend from different spots. Where we parked, it wasn’t that far to get to the sand, while other areas had longer descents. 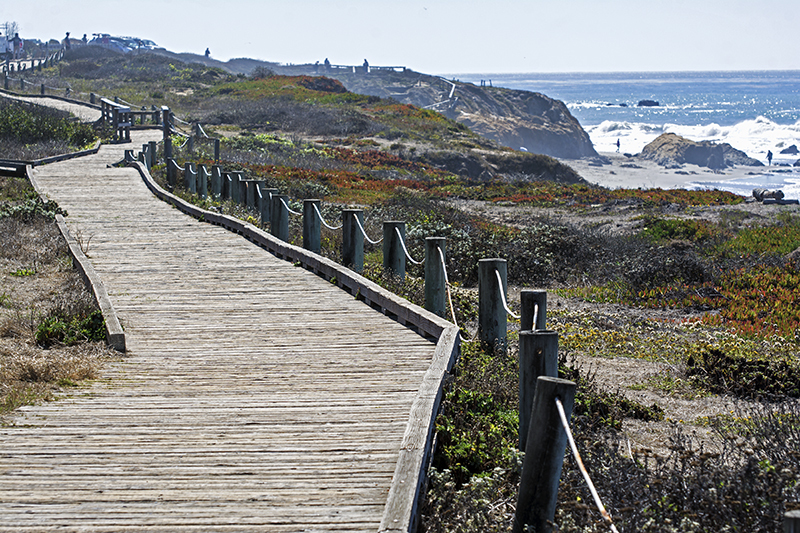 Wooden planked trails travel the distance of the bluffs so you can still enjoy the beach without actually being on the sand. 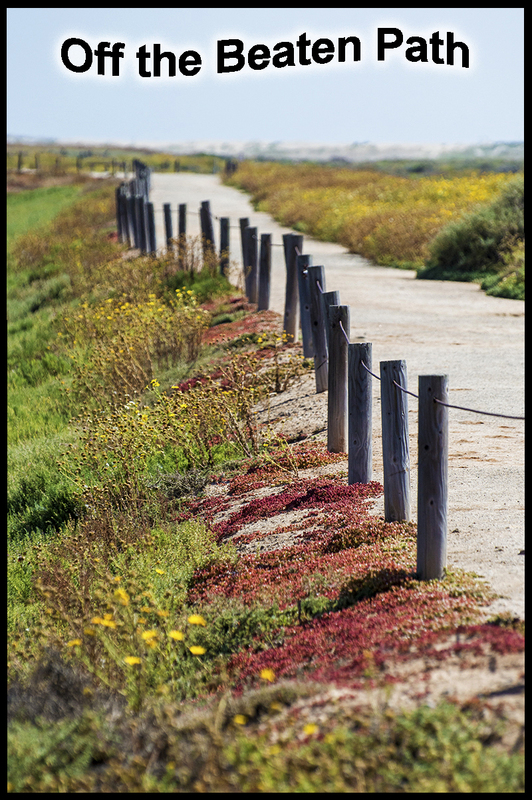 This is what I liked about the central coast, they always provide plenty of walking trails to enjoy the beautiful scenery. 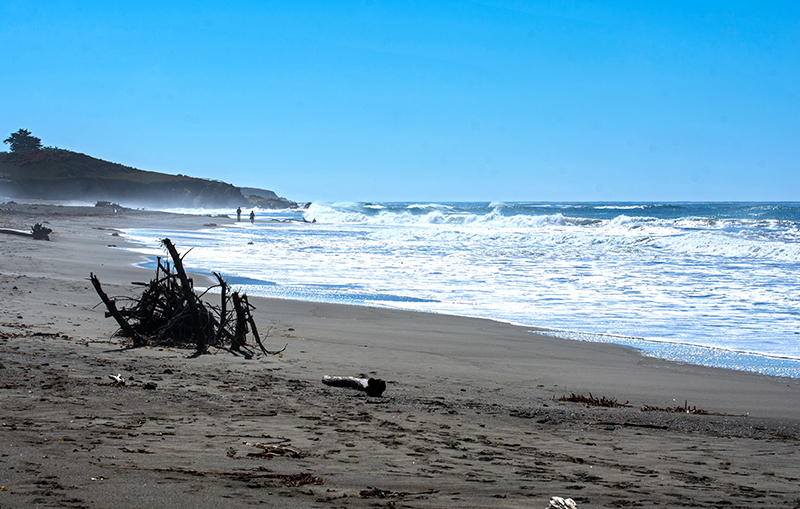 The beach itself is full of drift wood and one of the reasons that I feel makes it so spectacular. 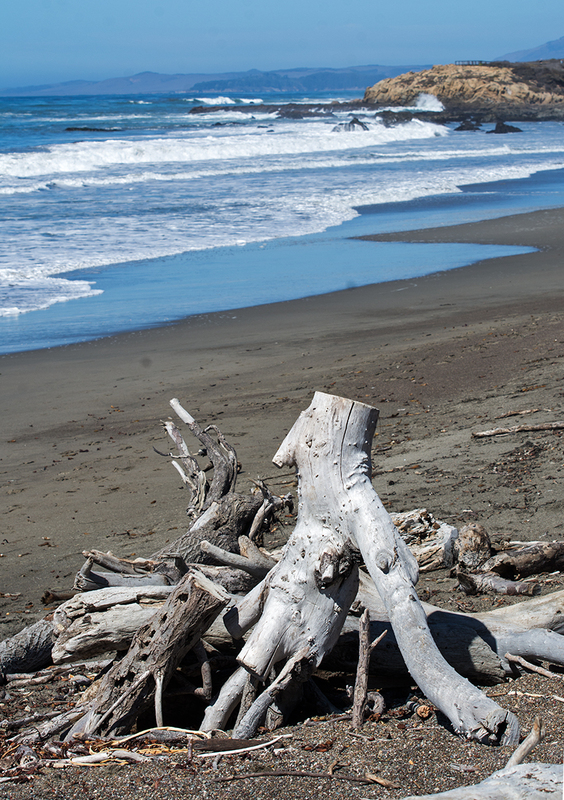 From small pieces to large tree stumps, this beach had it all. You don’t see a lot of drift wood in Southern California. 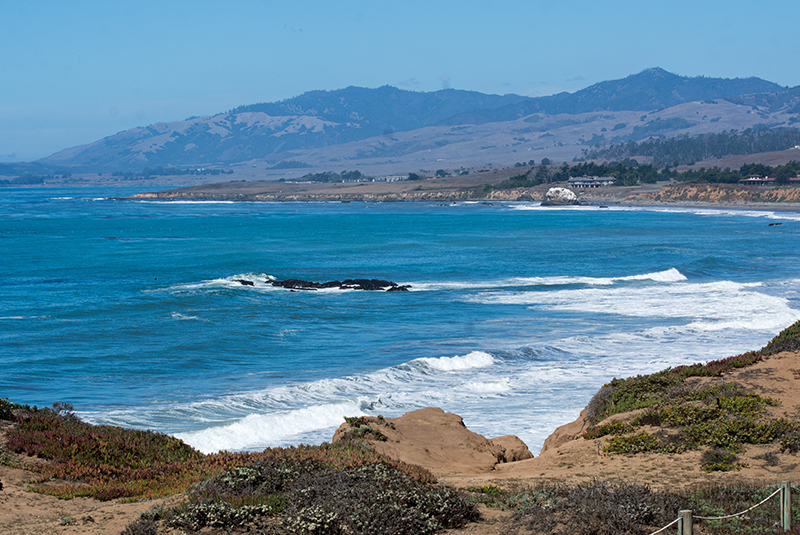 There were rock formations in various positions out at sea and through my telephoto camera lens I spotted the diminutive San Simeon Pier while Hearst Castle stood grandly on the hillside. With the naked eye you can see all the way up the coast and even though the rains had not yet fallen to give the countryside a splash of green, it was still a beautiful sight. 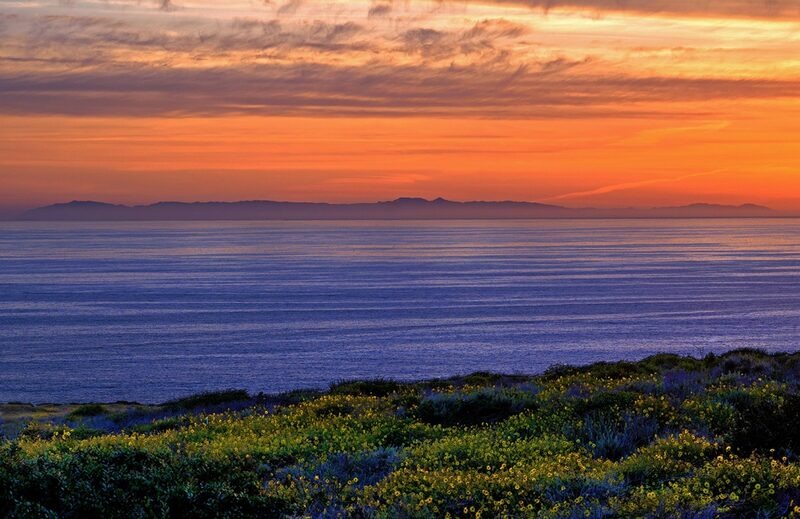 On this day, the Pacific Ocean was a shimmering bright blue although the gray haze on occasion passed through taking away some of the sparkle. 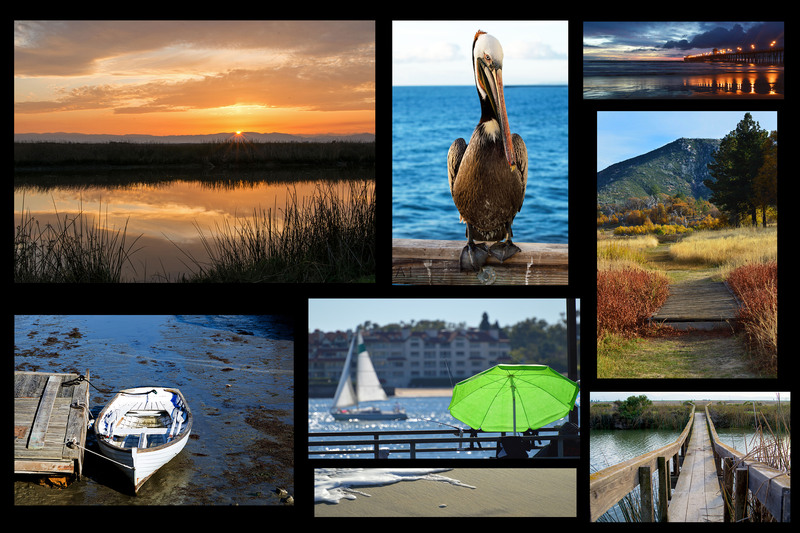 Central California is known for its marine layer that comes creeping on to shore periodically throughout the day. The water looked amazing enough to give a fleeting thought of jumping in for a swim. 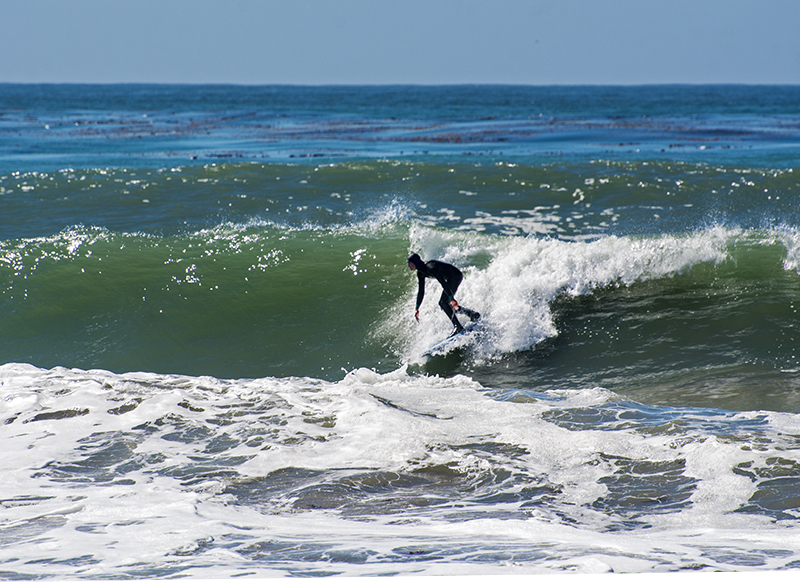 However, it didn’t take a rocket scientist to figure out the water was cold once you saw the surfers riding in full wetsuits and hoods. I was here on a tip that there was some great sea glass hunting. In the article I read, it said that the glass was hard to find but it was there. I found out why it wasn’t easy to find after five minutes of searching. 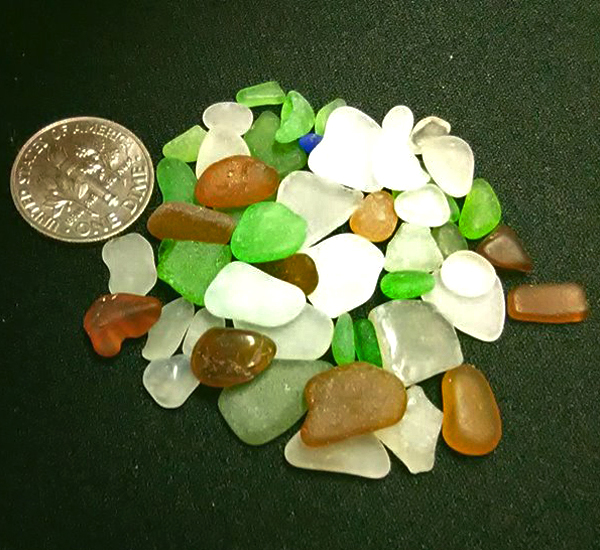 There are tons of really small rocks on this beach and the sea glass is equally as small! You really do have to search as every nerve in your eyeball will be used. Most are the size of a grain of rice, the largest the size of a half of a dime. 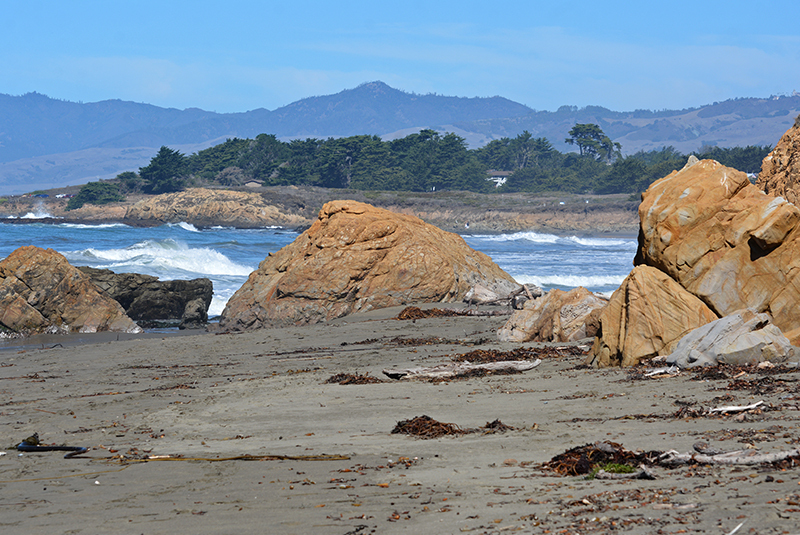 There was a rock formation in the distance where you could walk around to explore more of this massive beach, so I headed that way. As I turned the corner there they were!! I am not talking sea glass pieces, I am talking people! 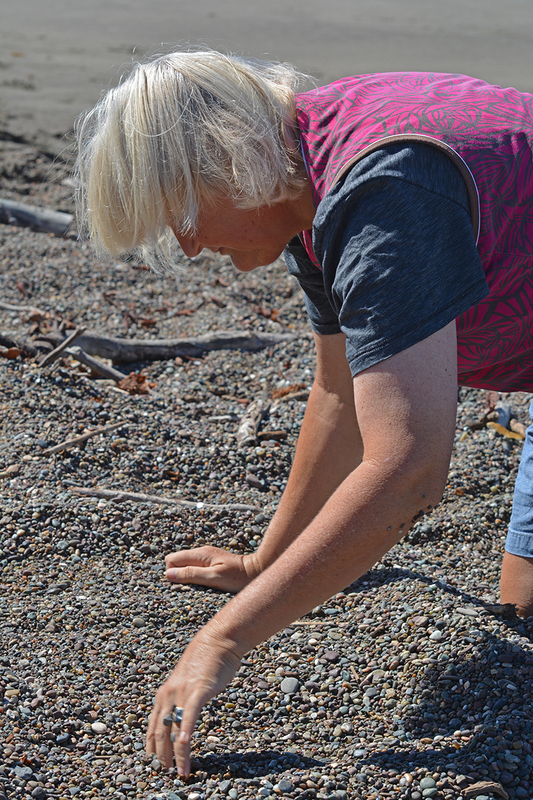 On a large mound of rocks, there were at least 6-8 woman sitting down while sifting through the small pebbles. Each person had a small plastic bag in one hand. All along the beach, men and woman were searching with heads bent down. I sauntered by three woman to get a glance of the colorful treasures they had in their bags. I was surprised that they didn’t have sea glass in their bag, they had white rocks! I asked the lady what they were looking for and she said rocks and Moonstones. As the words came flowing out of my mouth, I realized that I sounded like a little kid when I said, “What is a Moonstone? After all we WERE on Moonstone Beach, I had to know. She was nice enough to stop her searching to show me one. It is a white rock that had shinny sheen as if it was wrapped in cellophane and each one had black specs. As I talked to many others on the beach and with some asking me what I was searching for, I got various answers on the Moonstone rock. One guy said they came down the rivers from the mountains, another said they came from the ocean. One said they were called Moonstones because the round ones look like the moon, one said they illuminate, especially if held up against the moon. The latter explanation being the most correct. The Moonstone is in the lower left corner. See how it shimmers? I guess I wasn’t going to get my answer from this crowd but I do know one thing, they know how to find them. I wouldn’t know one if it bit me in the hand but their bags were at least a quarter full. 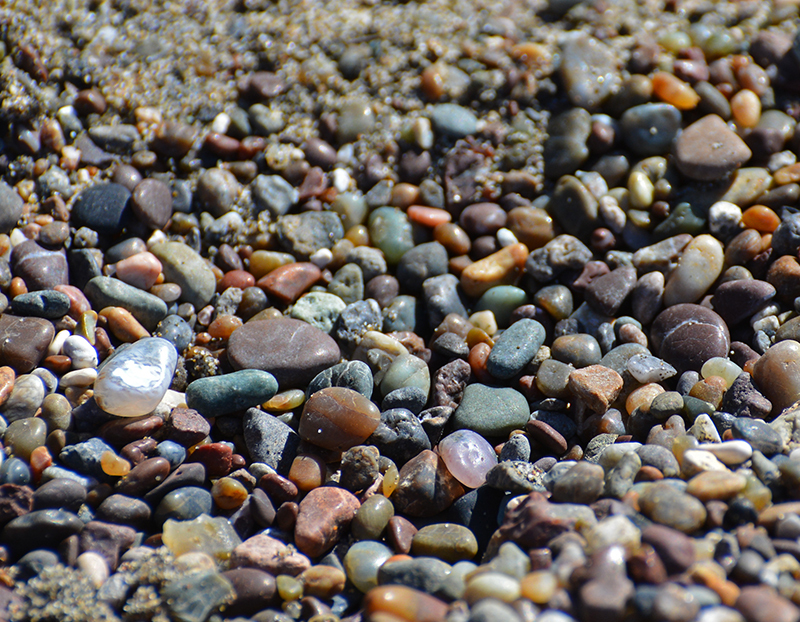 The Moonstones found on Moonstone Beach are not gem quality but these tiny feldspars do have a sheen that will in fact shine when held up against the moon. From what I read they also have incredible healing powers, something along the line as crystals I guess. 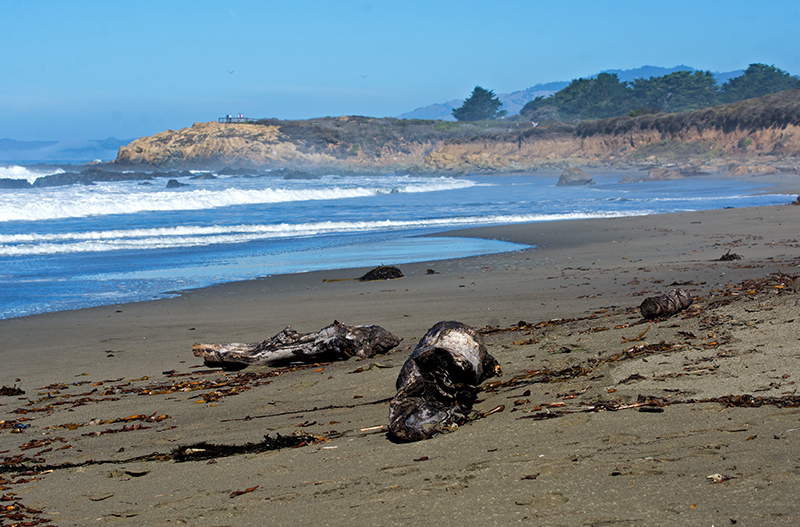 They obviously can’t be found everywhere so that is why they are a hot commodity on Moonstone Beach. We walked quite a bit along the shore finding about 25 pieces of glass. Nothing earth shattering but they were smooth and of great quality, just small. It wasn’t easy finding glass, however, sitting on a large piece of driftwood, I realized that you can’t have a bad day…hanging out on this beach.